The Sign of Three is another episode of Sherlock that doesn’t really have much of a plot, and is basically just window dressing for how clever the writers, and ultimately Sherlock himself, are. The thing is though that it is still highly watchable and a whole load of fun despite the lack of a proper plot, and the fact that this episode had three writers working on it! The framing story is of John and Mary’s wedding and Sherlock’s best man’s speech, where he explains about some of their cases as part of the speech, and also solves a case (which he had started to talk about only to admit that he hadn’t actually solved it) whilst doing the speech, which is really only the sort of thing that Sherlock himself could do. The title of the story is an allusion to quite a nice bit of news for Mr and Mr Watson, but not until right of the end of the episode, and wasn’t anything at all to do with the episode itself, a bit like last weeks episode really. 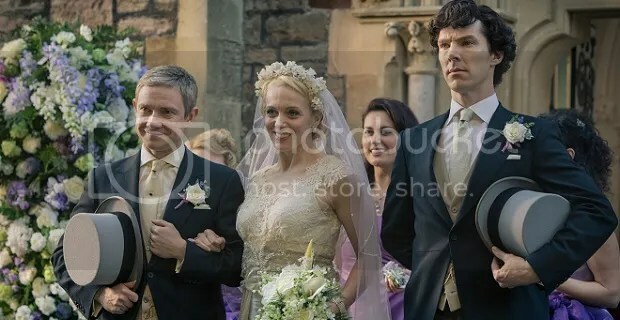 Sherlock’s best man speech is actually really touching, and it was funny when everyone was in tears during a particularly lovely part of his speech and Sherlock;s entirely bemused reaction to it all! The stag night scenes were also very funny, as was the game Sherlock and John were playing back at their flat when they could no longer handle the pace and the scenes between Sherlock, Mary and John planning the wedding. It is really quite amazing that they get away with this but it is such a well made series directed with such verve and panache, and the chemistry between the now three main characters is so good that it really doesn’t matter that there is absolutely no plot to speak of as you are just enjoying watching the characters interact. It is just such a shame that they make so few episodes of this! There really is no unifying conflict in season 3, and with one more episode left I’m wondering where they’ll leave the series. Is it the final season? I haven’t heard about another series yet but fingers crossed. I’ve heard there is going to be a series4 🙂 This was my favourite of all the episodes, simply brilliant! I hope so. I really enjoyed it too.